but the last half-mile is uphill! One week after finishing my longest distance (13.1 miles), I joined a one-mile race, the shortest contest that I've run. It's a fundraiser to renovate a historic but still operational fire station in the Virginia-Highland neighborhood. I haven't worked on sprinting, except for very short distances in the context of a longer distance, so I wasn't sure how this would work out. But I've run some miles under 8 minutes in a few 5K races. Knowing that I wouldn't need to pace myself to run a second or third mile, I figured like I would treat this as if I was passing the 5-mile sign in a 10K, ready to give it my all for that final mile. On a warm Thursday evening before the race, I ran the route a couple of times, the second time as fast as I could manage, covering the mile in 8:25. When I arrived at the start, it was clear that a big crowd had showed up to support the cause, including hundreds of children, many of whom were filling in the front rows. I had decided to run light, without my iPhone or tracker, as I felt it would be difficult to start it in time, although in retrospect it would have been fun to get some photos of the crowd. The day was sunny with clear skies, and the temperature was relatively cool, in the high 40's, perfect for a fast run. I had warmed up by parking near the finish area and jogging to the start, but then ended up standing around for about 30 minutes until we began. In the meantime, I enjoyed catching up with someone that I had worked with 10 - 15 years ago, who lives in the neighborhood. The elite group began their race as scheduled at 12:00 pm. After they had finished, the clock was reset for the "amateurs and weekend warriors", at our 6 - 9 minute per mile paces. I wasn't sure where an 8 minute runner should stand, so I found a spot about 20 feet behind the starting line, in front of the foremost stroller. Shortly before we began, I looked behind me and saw hundreds of people at my back. I just hoped that I wouldn't get trampled. With little fanfare, the race coordinator lowered his hand and the front line took off! The start was rather chaotic as we ran around a big tree at the intersection of Virginia with Lanier Blvd, then we had to avoid parked cars on the right side of the boulevard. Runners started on both lanes of the boulevard, but our lane was still quite crowded. I was moving fairly quickly in the right lane with the downhill start but also had to run very carefully. I passed a number of adults who had lined up in front of me and quite a few of the children, but sometimes had to slow down just a bit before finding a safe place to pass. As fast I was running, there were still hundreds of people in front of me and I couldn't see the front of the pack. Fortunately I didn't see anyone fall or trampled in my area. 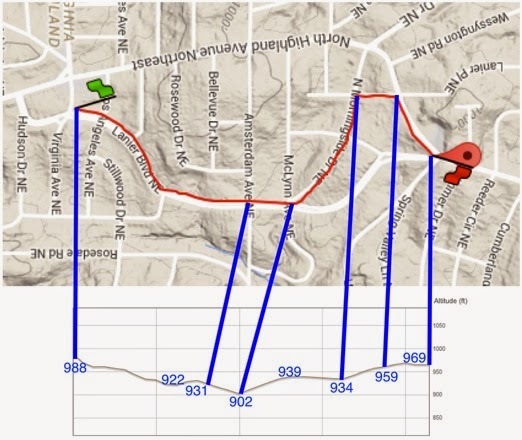 I ran the route on Thursday evening and recorded the map and elevation profile. The road leveled out as we approached the intersection with Amsterdam Ave, and then another downhill took us to a big intersection of Lanier Blvd with McLynn Avenue and Morningside Drive. Somehow we had narrowed to a single lane although I missed where that had happened. But making the diagonal turn onto Morningside, I knew that the hard work was about to begin. Pumping with my arms, I managed to go uphill fairly strongly, passing a few people on the way up. Normally I wouldn't have pushed it like that, but knowing that the finish line was less than a half-mile away meant that I didn't need to save much. The road leveled out for one block, and there a few people caught up and passed me, although no one shot past too quickly. Then we made a right turn onto Lanier Place. This was a 25-foot rise in a single block, which was pretty rough, but before I knew it we had made another right turn onto Highland Avenue. Spectators were lining the road cheering us on, "Not much further!" I tried to pick up speed but I don't think that I managed it, although I passed a couple of people who were reduced to a walk even in this final block. Approaching the finish line on North Highland Avenue. Look at the beautiful blue sky and the spring growth on some of the trees in the background. I love springtime in Atlanta - other than the pollen! When I saw the clock at the finish line, I couldn't believe it: the time was just clicking over to 7:00, and I crossed the line at 7:03. Amazing! Before the race, I was pretty sure that I could finish in less than 8 minutes with people pushing me, if not physically at least psychologically, but I didn't imagine that I would finish so much quicker than 7:30! Of course I could not have run a second mile at the pace, but it was a great test of my endurance and stamina to this point. The winner finished in a scorchingly fast time of 4:28, and the 50 - 59 male age group winner ran 5:27. P.S. My throat was quite sore shortly after the race, and at first I was afraid that I was coming down with a cold. After drinking my third bottle of water post-race, I realized that it was from inhaling the Virginia-Highland-Morningside spring pollen along the tree-lined race route! Goal: To finish a one-mile run in less than 8 minutes; Achieved!! Congrats! My wife ran it in 7:07. I'll probably run in it next year. 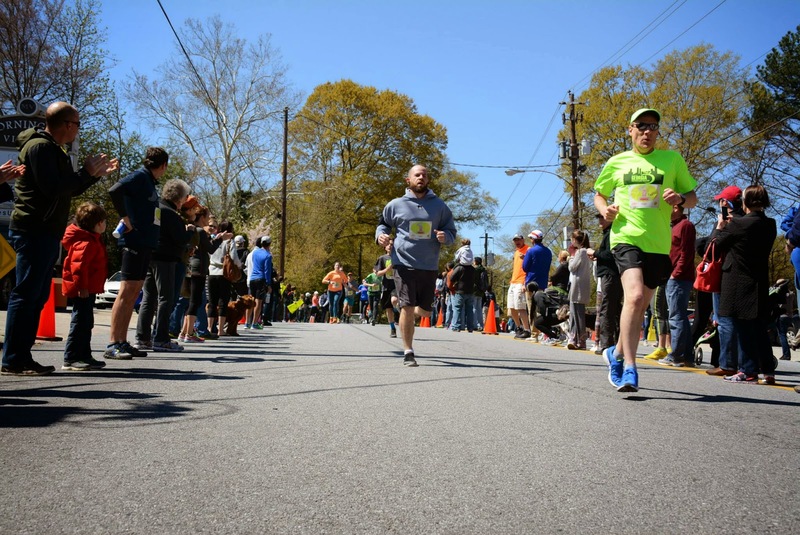 Did you volunteer at the Atlanta Women's 5K? Thanks! and congratulations also to your wife! I wouldn't have believed that I could run a mile at close to 7 minutes, and now I have to try to break 7 minutes when I run it next year! I've started on the Hanson's Half Marathon program and that will keep me going when I'm doing speed work beginning in a few weeks, to know that I can do it because I've done it before. Right now I'm trying to figure out how to schedule in a 2 - 4 mile run nearly every day. And I did volunteer at the Women's 5K on Saturday. I was working the food line and it was fun to see the various emotions on the faces of the runners, just 30 seconds after they had finished, from the fastest group to the end of the race. It turns out my wife is three people back in the green shirt in your picture! Congrats Frank! Great job! I've never run the mile, but I thought about doing this one this year. Good too know that the course is off Highlands Blvd(that would be a bit hillier. Definitely a race to keep in mind in the future!